but the penthouse suite will have to do. 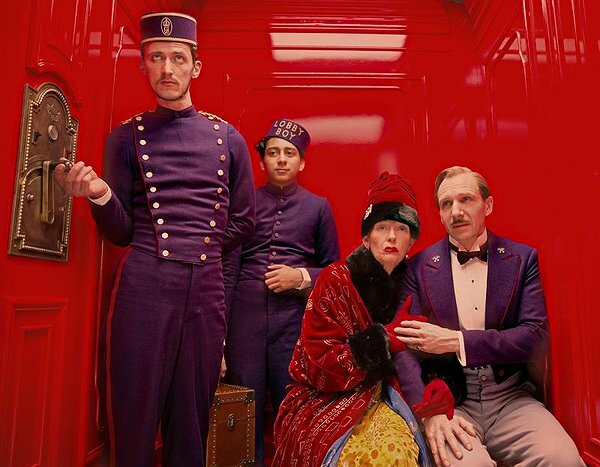 A marriage of classic conventions and its director’s distinctive oeuvre, Wes Anderson’s The Grand Budapest Hotel isn’t a story so much as paen to storytelling. Its journey through the narrative looking glass is not just chronological, but also a matter of mediums. It begins with a teenage girl in 1985 sitting in a cemetery beneath a monument honoring a late legendary author, reading his defining, titular novel. The audience quickly transitions to the formerly aging writer (Tom Wilkinson) evincing his evocative, and then on to 1968, when his younger self (Jude Law) encountered Zero Moustafa (F. Murray Abraham), the reclusive owner of The Grand Budapest, a remote mountainside resort with faded grandeur located in the fictional European Republic of Zubrowka. Over dinner in the hotel’s cavernous atrium, Moustafa shares with the writer how he purportedly acquired the Grand Budapest, beginning in 1932 when Zero was an aspiring lobby boy under the tutelage of Mr. Gustave H. (Ralph Fiennes), the hotel’s renowned, fastidious concierge. A perfumed, mannered mainstay, Gustave is also a bit of a rapscallion, performing “exceptional service” for the hotel’s rich, aging and blond female clientele. When one of his regulars, Madame D (Tilda Swinton), passes away under mysterious circumstances, it triggers an opéra bouffe involving a famous painting willed to Gustave and the malevolence of Madame D’s children, especially the devious Dmitri Desgoffe-und-Taxis (Adrien Brody) and his assassin-for-hire, J.G. Jopling (Willem Defoe). And all this takes place against the backdrop of an encroaching fascist regime. This, as well as the broader setting, lends The Grand Budapest Hotel an historical context (albeit fictitious) missing in Anderson’s other works. At the same time, the director’s trademark whimsy is in full regalia, spearheaded by Fiennes, whose deadpanned farce singlehandedly sustains the film and settles seamlessly into the traditional troupe of Anderson regulars, which here includes appearances by Jason Schwartzman, Owen Wilson, Edward Norton and Bill Murray. Also joining the costume parade are Jeff Goldblum, Harvey Keitel, and Saoirse Ronan as Agatha, baker for the esteemed Mendl’s Patisserie and a burgeoning love interest for young Zero (played brilliantly by Tony Revolori). In truth, most of these roles are little more than famous people playing dress up. But in Fiennes and Revolori, the film finds its comedic and spiritual soul, a buddy comedy played with impeccable timing and earnest camaraderie. There’s an otherworldly quality to the set design and cinematography—Anderson even varies the film's aspect ratio with its time periods, with older settings shown using classic 1.33 and the more contemporary scenes shot in 1.85 and 2.35:1 widescreen. While such flair is not unusual for Anderson, here it serves to ensconce how, through the prism of storytelling, a memory can morph from tale into fable into myth. By the time the film circles back to its opening cemetery, all the grand doings around The Grand Budapest Hotel are distilled down to the pages of a book. It’s a reality that, like the film itself, is both exhilarating and melancholy.